Hen Groups love coming to Glazydayz for a girlie, chatty, relaxing and fun time, painting pottery. And we love having them! 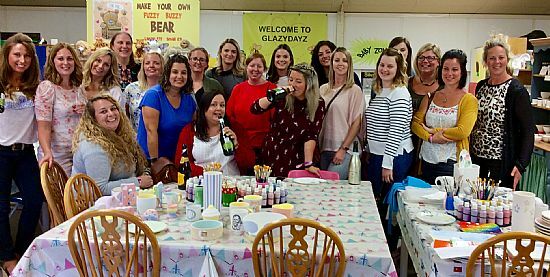 For something fun and relaxing, and for some of that lovely and special girlie bonding, Glazydayz is great for Hen Groups. You can come during our regular opening hours, or you can book for an out-of-hours event and (subject to minimum numbers) have exclusive use of the studio. If you've booked the studio for your group's exclusive use, we can lay it all out especially for you. It's all very flexible....... but whatever you choose to do, we guarantee you'll have a fabulous time and you'll create some wonderful gifts or keepsakes to treasure forever! We are a fully-equipped cafe as well as pottery-painting studio, and we can provide a range of soft drinks, teas & coffees, along with snacks and light bites, or full buffet meals, for your Hen Party. Since we're not licensed, you are welcome to bring your own wine. If your group chooses to make a gift set for the bride and groom, we have lots of tips and advice to help you create a co-ordinated matching set - even though each piece is painted by a different person! (There's no minimum spend during our normal opening houres, when you'll share the studio with other customers). (a) Large pottery plate, signed with personalised messages for the bride-to-be from everyone in the Hen group: £24 (or FREE if there are 10 or more in your group). (b) Afternoon Tea (the old fashioned way, with choice of sandwiches & cakes) or a Finger Buffet of light snacks; add £6 per person.